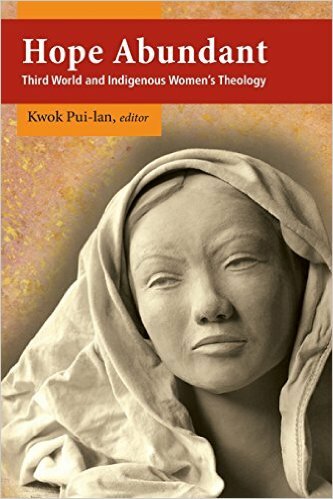 Feminist theologians in Asia, Africa, and Latin America gathered together and produced this edited volume of theologies from the perspectives of indigenous women in Third World. In this book, the indigenous women are not merely defined by geographical locations, but by their common experiences of “the struggles against social and political oppression, cultural alienation, and injustice as a result of sexism, racism, classism, colonialism, and other forms of oppression” (2). Reflecting on their experiences, this book tries to uphold the legacy of Third World feminist theologies, which was introduced by the publication of With Passion and Compassion: Third World Women Doing Theology in 1988. This book aims to offer readers “an overview of recent developments in Third World and indigenous women’s theology” in their changing contexts: globalization and its negative impacts on the women’s lives (10). In this book, each theologian’s work in different continents has been organized by the following thematic parts: (1) Context and Theology, (2) Scripture, (3) Christology, and (4) Body, Sexuality, and Spirituality. Given the purpose of this journal, in this review, I will focus on articles written by Asian feminist theologians in each part. Wong Wai Ching Angela’s article Women Doing Theology with the Asian Ecumenical Movement gives readers the context for the development of Asian feminist theology: the Asian ecumenical networks, including the Christian Conference of Asia (CCA), the Asia and Pacific Alliance of YMCAs, and the World Student Christian Federation (WSCF) Asia-Pacific Region (36). These ecumenical networks and gatherings helped Asian feminist theologians crystalize their own conceptual framework for the theological work of Asian women, what they call “doing theology”: it emphasizes its (1) methodological commitment to ongoing reflection on women’s “life in practice” and (2) ethical-political commitment to “the people who are ‘disprivileged’ and marginalized” (40-41). In the part of Scripture, Monica Jyotsna Melanchthon’s article Dalit Women and the Bible presents her hermeneutical and methodological reflections on biblical interpretation from the perspective of the Indian Dalit women. Melanchthon argues that the Dalit woman is “thrice alienated from the resources of society owing to her gender, caste, and class”: (1) her subordination to men, (2) her socio-cultural position as an “untouchable” (the Dalit), and (3) her low economic status given the lack of education and access to well-paying jobs (106-107). The experience of the Dalit women is claimed as the starting point for biblical hermeneutics, and their experience in “their struggle for survival and liberation” is “the point of departure” in this new hermeneutics (112). Especially, Melanchthon suggests the Dalit women’s lived practices—“storytelling” and “role play”—as new methods of interpreting the biblical text (117-119). Sharon A. Bong’s article The Suffering Christ and the Asian Body reconstructs a Christology in relation to the Asian women’s bodily experiences in suffering, resistance, and healing. She correlates the Asian women’s bodies that (1) “suffer” from a variety of forms of structural and cultural violence with the suffering Christ and (2) “resist” and “heal” in their “compassionate identification and solidarity with the marginalized” with the resurrected Christ (187-191). In other words, this “Christology from below” aims to discover the embodied Christ in the Asian women’s bodily experiences (191). In the last part, Carmelita Usog’ article Women’s Spirituality for Justice introduces Filipino Catholic women’s reconstruction of the notion of spirituality given their relentless activism for justice. By rediscovering the mystical tradition of women (i.e. Hildegard of Bingen and Julian of Norwich), Usog argues that spirituality has to be understood with “the age-old quest for fulfillment and liberation” (261). She further draws on Filipino Catholic women’s social movements on the ground, and redefines spirituality as a “cry for justice” (263). It is a “power that resists the limiting and death-dealing structures in society” and “fulfills the quest for self-discovery, self-affirmation, and self-inclusion, for all of us in the human community have the urge to live and to live fully as human beings” (263). She then explores how this notion of spirituality has been powerfully enacted by the women’s rituals (i.e. telling stories of women) and liturgies (i.e. utilizing symbols in their daily crafts) in their works for justice (264). Among a lot of praiseworthy aspects, what I most appreciate is this book’s keen attention to social and cultural structures in our globalized societies that marginalize, alienate, and oppress the Asian women. Specifically, “the culture of silence” identified in this book is particularly harmful to the women’s lives (40). This book is valuable since each chapter carefully reflects on the women’s experiences and practices in their struggle for breaking this toxic culture: (1) ecumenical networks and gatherings, (2) story-telling and role play, (3) bodily experiences of suffering, resistance, and healing, and (4) rituals and liturgies for justice. This book demonstrates the importance of the women’s praxis on the ground as a foundational source for doing theology. However, perhaps we might need to ask this question: “To what extent does an academic theologian genuinely represent and/or advocate the unheard voices of the marginalized”? As we explored, “doing theology” includes its ethical-political commitment to raising the voices of the marginalized. In order to fulfill this commitment ethically, a theologian must minimize a possibility of misrepresenting, distorting, and/or exploiting their voices. For this task, a theologian is required of “constant engagement with the large mass” of the marginalized (117). Hence, I suggest that a theologian, who desires doing theology ethically, needs to be concerned with her/his concrete methodology that appropriately secures the constant engagement with the marginalized and deep immersion in socio-cultural fabrics of their everyday lives. This methodological concern would bolster the ethical commitment in doing theology.